Back in January I listed my goals for 2013. As we are nearly half way through the year I thought it was time to catch up and see how well I'm doing. One aim was to try a new recipe each month, and my very first attempt was this Thai Coconut Bake, inspired by BBC Good Food. Optional: other veggies. I like to add sweet potato and spinach, and you can leave out any of the veg that you don't have or don't like. I have used turkey instead of chicken, I guess you could use any meat really. Yum! 2. 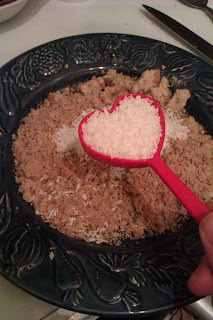 Make your bread crumbs by whizzing up a loaf crust in a blender or with a hand blender. Combine the bread crumbs with the dessicated coconut in a bowl. 4. Dip your chicken breasts in the whisked egg, then in to the bread crumb and coconut mixture. 5. Put the cubed veg and thai red curry paste in to a roasting tin and give it a good shake to make sure everything is covered. 6. 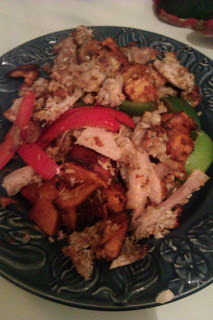 Add the breadcrumbed chicken on top. 7. Pop in the oven for about half an hour. I like to give mine a stir half way through. 8. Plate up and serve with a sprinkle of coriander and good squeeze of lime juice. 2. 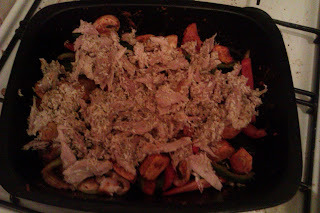 Put cubed veg and chicken in a roasting tin and cover with thai red curry paste and coconut. 3. 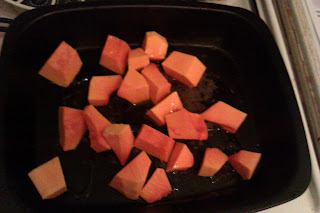 Place said roasting tin in oven until everything is cooked. To be honest with you, both ways are super tasty and very easy. This has become one of my favourite meals now, and it is a great way to use up veg.